When you write a blog and also have a vintage sales business, you meet a lot of wonderful and interesting people. I consider myself lucky to connect with folks that are like-minded and have a passion for turning something old into something new again. 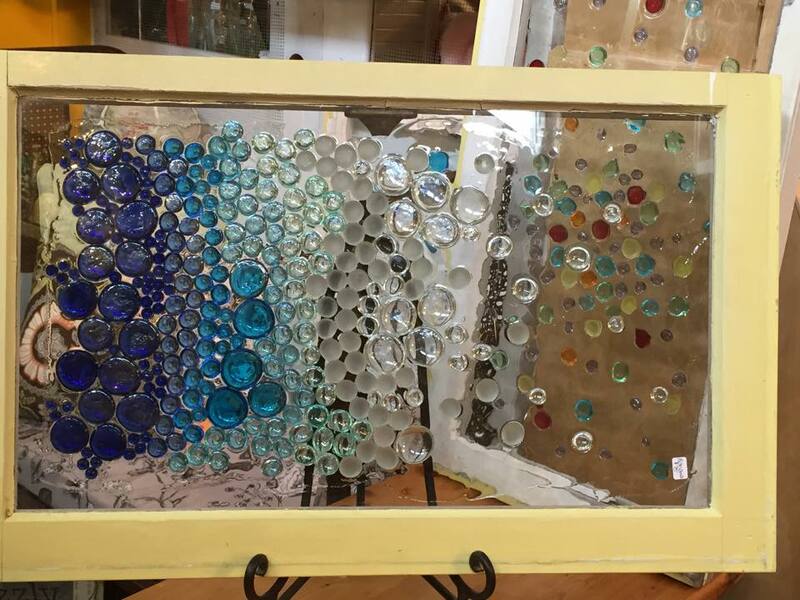 One such person turned an old window into a beautiful piece of art. As soon as I saw it, I was full of questions. I knew I wanted to show it to you. I also asked her to share how she made it. T (I will refer to her as that throughout the rest of the post) was born and raised in Alberta Canada and still lives there. She started crafting at an early age, when her mom taught her to cross-stitch. She also dabbles in quilting, sewing , knitting and card making. 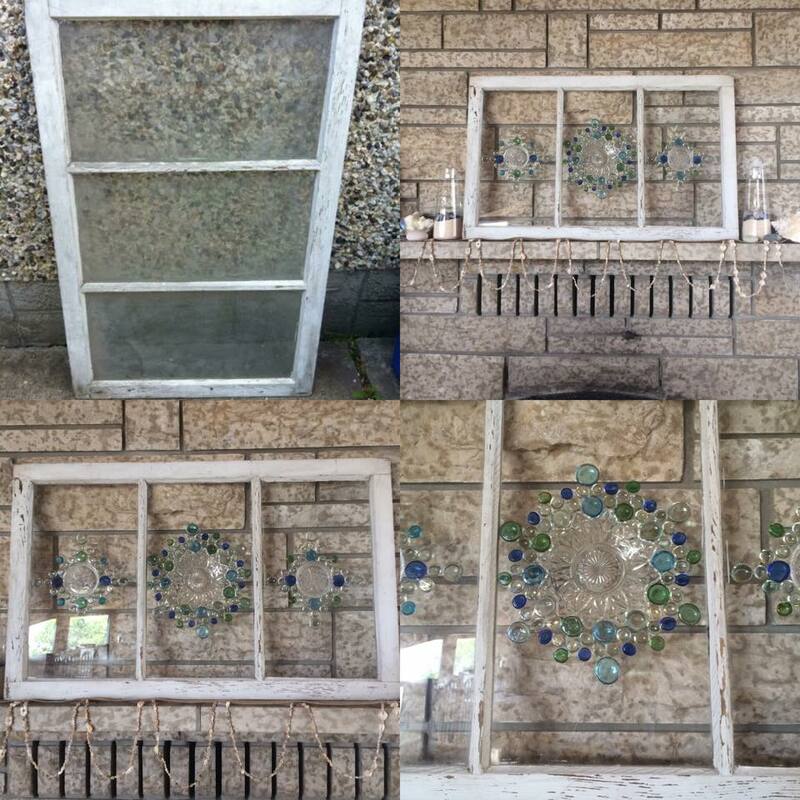 T enjoys a good home decor challenge and when she saw the idea on Pinterest of how to turn an old wooden window into a piece of art she knew she wanted to do her own version. I asked T where she found the materials for the project. The window frame took the longest to find as she didn’t want one that would need a lot of repair. She found one for sale on an antique Facebook selling group. 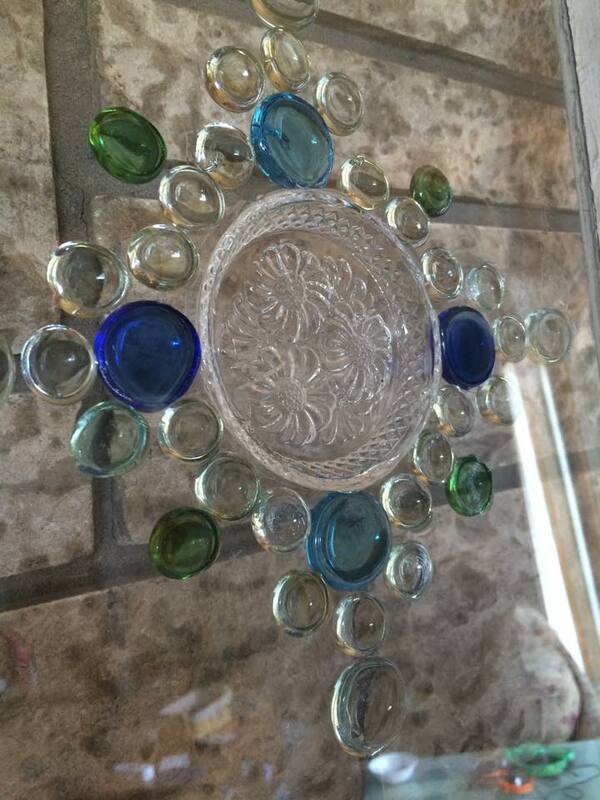 The plates were found at Value Village, the glue (LePage 100%) was purchased at Walmart and the glass stones were from the local dollar store. In total it only took approximately 1.5 hours. The longest part was deciding on the design. Once the window was clean (the frame and the glass), the plates and stones were glued to the back of the window. The biggest challenge was knowing when enough was enough and not overdoing it. T does an ocean/beach theme in her house in the summer and had the frame resting on her fireplace mantle. It fit the decor style perfectly with the blue and green glass stones reminiscent of sea glass and the white frame like the weather worn wood walls of a house on the beach. 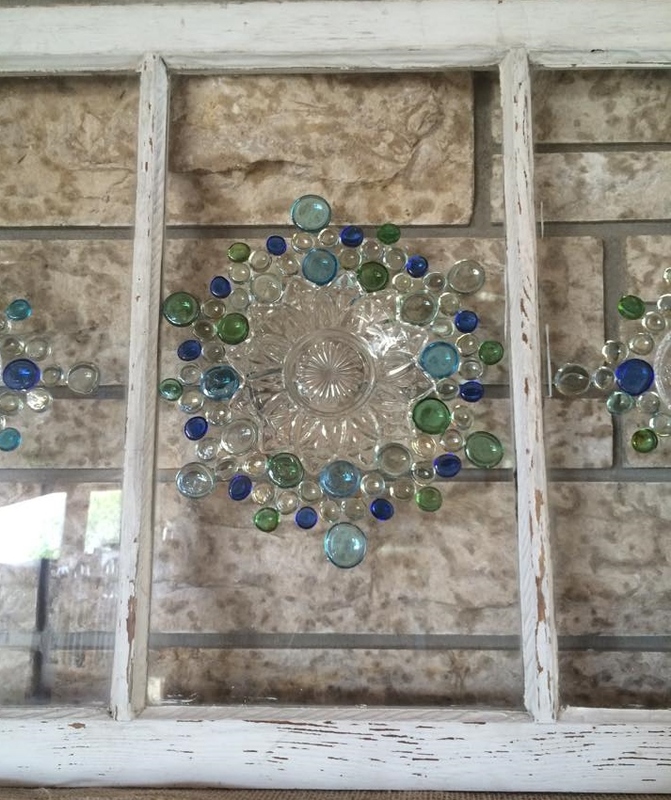 Here is another example of an old window turned into art. I saw this in an antique store. For her next project T told me she wants to make a Christmas/winter themed version of window pane art. I am really looking forward to seeing that when it is finished. I absolutely love the way T’s turned out and the idea of making Art by upcycling an old wooden window pane and frame, well now that really is A Wandaful Thing! Have you done this? I’d love to see what you made. This entry was posted in Decorate, DIY. Bookmark the permalink. Stunning and such a great idea! Thanks and I am really looking forward to seeing her “Christmas” creation.